The question of how on earth to find work/life balance comes up a lot amongst teachers. It’s a serious challenge, one that baffles so many great educators who are pouring their life into their students but worrying they’re not leaving enough for their families. 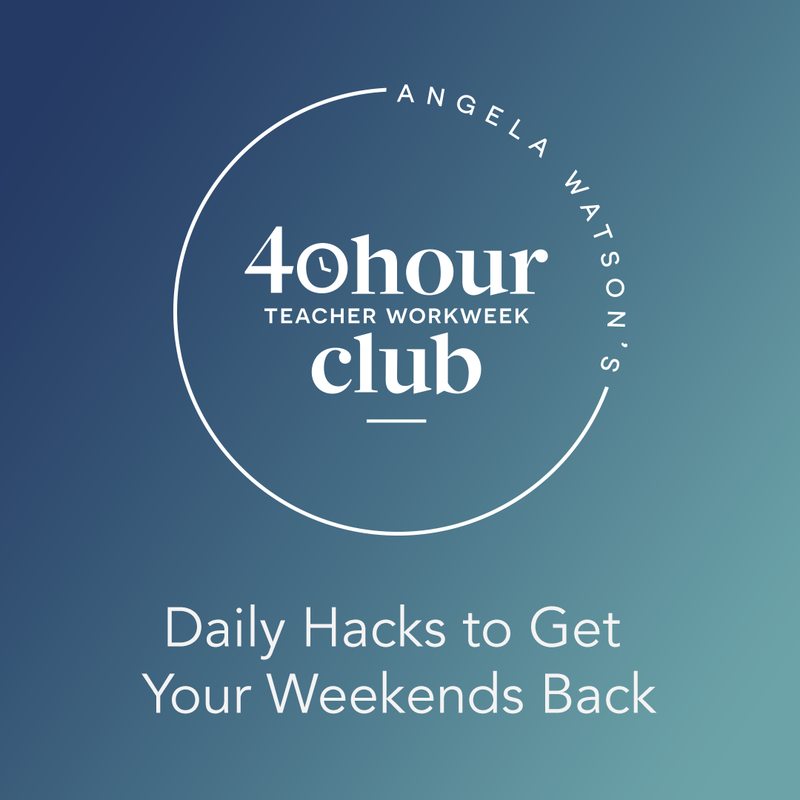 But if you’re really serious about finding balance, about being an incredibly effective teacher while still having time for yourself and your family, there is one solution for you – Angela Watson’s 40 Hour Teacher Workweek Club. Today, I’m thrilled to share my discussions with Misty & Laura, 2 teachers who are members of the 40 Hour Teacher Workweek program. They share their experience and advice, giving you a unique insider look at this life-changing program. When Misty’s husband told her “we need to see you too,” she realized she needed to make some changes to find some balance. She couldn’t keep spending all her time at school. When you implement new programs, you have to take the time to set up the system. But if you’re willing to do that, the payoff is tremendous & saves you tons of time in the long-run. It’s truly a great investment. Remind & other programs Misty’s found from the 40 Hour Teacher Workweek Club have helped save her tons of time once she set them up. The weekly emails from the 40 Hour Teacher Workweek are super helpful. Misty prints it out & skims through it, making quick notes that she can look back on throughout the week. Find a colleague that you have the ability to be frank with & when you have something to proof, give it to them and ask them to take a look over it. Their fresh eyes & feedback will do a much better job much more quickly than your pouring over it again and again. Organize all your digital files on a flash drive so that you have everything in the same place & know where to find them. 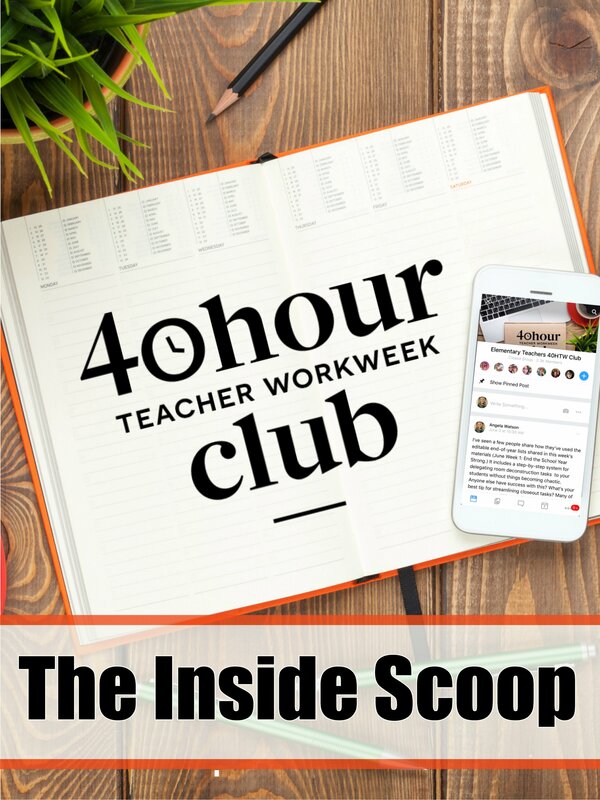 The 40 Hour Teacher Workweek is a huge value. Our schools spend thousands of dollars to send teachers to professional development & that can’t even touch 1/3 of the helpful info Angela gives us in just one month of the program. Be intentional about your breaks. It’s easy to get sidetracked by the internet. Look at your list & see what is the main thing you need to do and do that first, even if you don’t want to. That one tip has been awesome. If you have high standards – for example, you want your house cleaned perfectly, you might want to relax your standard. If your kids will clean the house 80% of the way you’d like it to be, that’s okay. Let them do it & take that off your plate. Put schedules & boundaries around your time. If you give yourself the whole day to complete a task, then it will probably take the whole day. But if you give yourself a time limit, it’s easier to get it done in that amount of time. Angela has given awesome tools to help us schedule our time – not only for work but also for family, personal, and relaxation times. It’s easy to feel guilty about relaxing but when you make it part of your schedule it’s guilt-free. The Facebook group is awesome. It’s nice to know that I’m not alone. I often feel like I’m the last one at school & there are other people there who understand that. And it’s a great place to pick up tips as well. I love that Angela has the weekly updates in both audio & print form. I love to read & listen to it at the same time for optimal focus. How can I find balance too? Promise yourself you’ll get it together this summer and figure things out on your own. The first option is to decide you basically know enough to get a little bit ahead and you’ll figure out the rest on your own. You’ve tried before to get your life in better balance, and it didn’t exactly go as planned. But you can promise yourself that things will be different this time, and you’ll muddle through and figure out a better system. Get ongoing support & a step-by-step system for streamlining every aspect of your work. The second option is to let Angela do the hard work of figuring out the system for you, and show you step by step exactly how to streamline and simplify every aspect of your work. You can utilize the years of research she’s done and all her experience mentoring hundreds of other teachers on productivity, and let her provide the support you need so that this coming school year will finally be the one where you can get out of survival mode and enjoy your life a whole lot more. There’s basically a complicated and time-consuming way to move forward, and a more strategic way. You can probably guess the way I’d like you to go. I could talk forever about the 40 Hour Workweek, why I believe in it so strongly, but I’ll just leave it at this: It works. I’ve seen it work firsthand. I’ve seen the unsolicited testimonials from teachers who are sharing their victories in the Facebook group. This is an area that so many teachers are struggling with, and I just want everyone to know about this solution because I truly believe that it can be just that for so many teachers – the solution you’ve been looking for. As I said, I could go on forever, so if you’d like more info or if you’re ready to join, head on over to teach4theheart.com/40hourteacher. There you’ll be able to hear more about the club & join the second doors are open – which is Sunday, June 26. And please – I want to make sure you understand that the enrollment window is very small. This club only accepts new members twice a year and this is one of them. You can join from Sunday, June 26 through Wednesday, July 6. After that, you have to wait until January. Disclaimer: I am partnering with Angela Watson to help spread the word about this amazing program. If you enroll in the club after clicking the button above, I will receive a percentage of your enrollment fee at no cost to you. 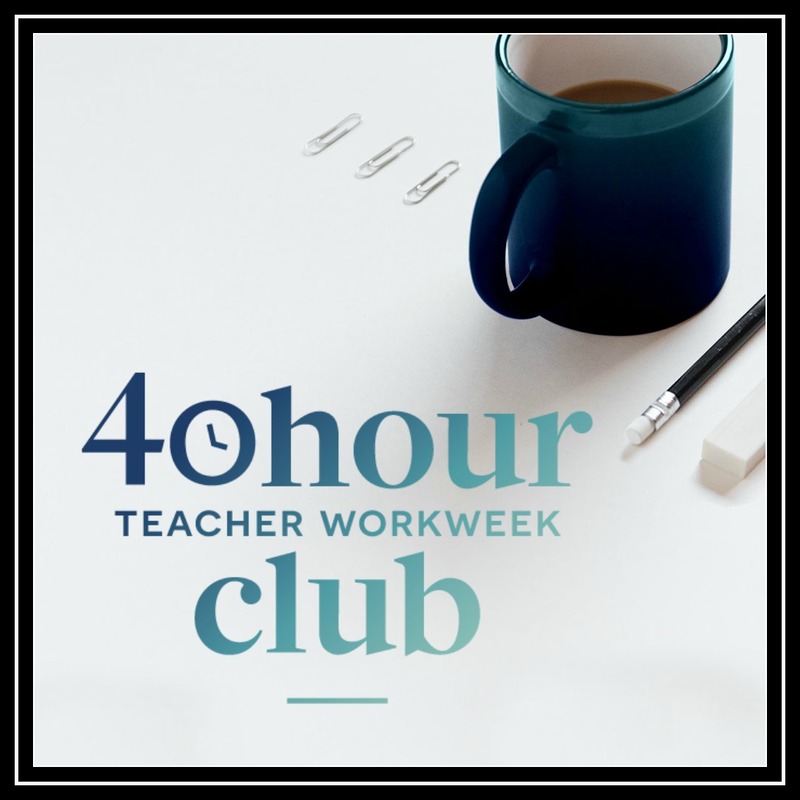 If for any reason this makes you uncomfortable, you can simply google “40 Hour Teacher Workweek.” Please know I am only recommending this program because I think it’s amazing and believe it will be a great help to many of you.